How far along? 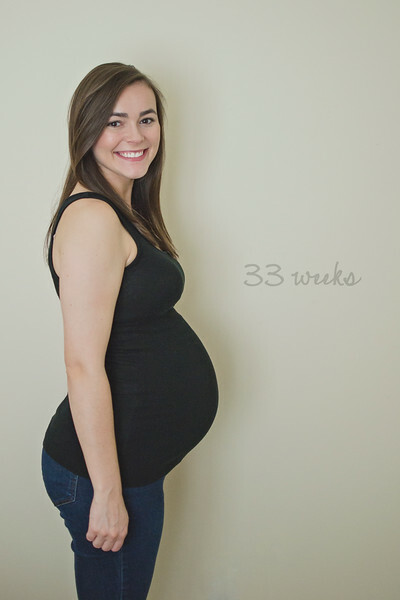 35 weeks- the last week of month 8! We are officially in the homestretch. Total weight gain? 24 pounds total at my 32 AND 34 week appointment. I think my weight gain is tapering people!!! Stretch marks? Belly is stretch mark freeeeeee. Miss anything? My eyesight has gotten worse. Again. Still wearing my glasses to work everyday, but I've noticed I struggle with my contacts when I change into them after work and when I wear them on the weekends now. Movement? Her movements are definitely stronger- sometimes a little jabby if she stretches those little feet up into my ribs. Sensitive area for sure! Food cravings? Watermelon, applesauce, raisins. How's the bump? I can definitely tell she's been growing! She has the hiccups at least once everyday- if not twice. My lungs are getting crowded at this point, especially when she sits a little higher. And when she sits low I can hardly carry her around- SO heavy! My stomach is feeling the pressure of her as well. (Since week 32) I've been slightly uncomfortable after eating- and I finally had to stop eating cereal for breakfast last week because of how uncomfortable it made me feel afterwards. I literally felt like a stuffed turkey and there was so much pressure. Luckily, this has already seemed to ease off! Unfortunately, backaches have become a little more regular over the last few weeks as well. Labor signs? 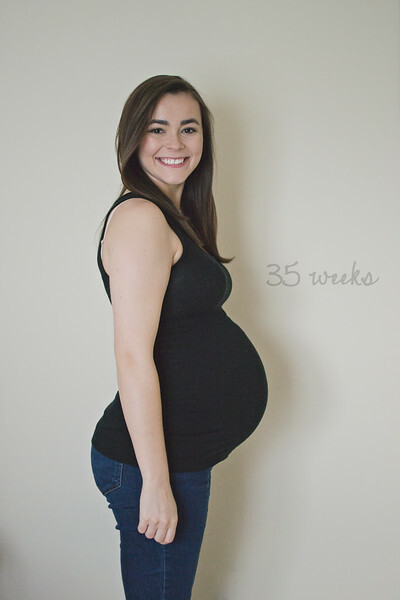 Braxton hicks began literally the day after I posted my last bumpdate (at 31 weeks, 1 day). They've continued off and on over the past few weeks. They feel like mild period cramps, and my mom said they felt the exact same for her. Word of advice- DON'T GOOGLE WHILE PREGNANT. I convinced myself I was in preterm labor and panicked. Wedding rings? Yesterday I noticed that they were a little snug.. I internally freaked out thinking, "This is it. I'm officially retaining water. I'm going to look puffy the rest of my pregnancy. Now my face is going to swell up, and then my ankles. And then everything else. And I'm going to be miserable. And feel hideous." You get the point. Luckily my wedding rings fit completely normal today, so I'm breathing a giant sigh of relief! Happy or moody most of the time? Happy. Everything (mostly everything) on my to-do list is complete. So no more anxiousness! Looking forward to? My 36 week appointment. We get to see our sweet girl via ultrasound! It feels like foreverrrrrr since we've seen her last. I can't wait to hear her little heartbeat and see how much she's grown!